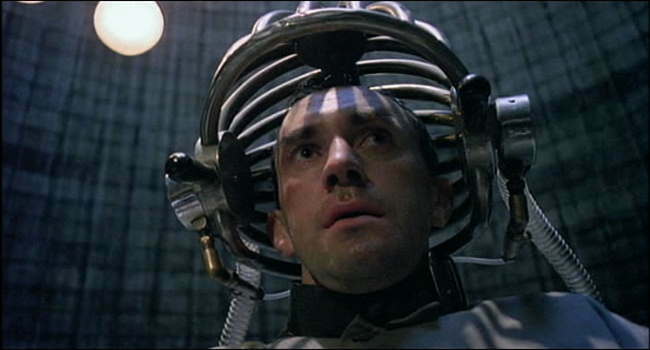 Jonathan Pryce in Terry Gilliam's wildly imaginative "Brazil." Rarely has science-fiction been done as well as Brazil. It exceeds all imaginative boundaries, venturing into areas so original and unexplored that to see it on the silver screen sparks only pure enjoyment and cinematic pleasure. The film has no set time period. The set design would suggest that it’s set in the future, but a superimposed title reads “Somewhere in the 20th Century”. Jonathan Pryce stars as Sam Lowry, a workaholic who leads an uneventful life. Often enough, his mind wanders into dreams of fantasy, where he soars through the air, searching for a mysterious and unknown love. The futuristic world in which he lives in is subject to infrequent spouts of terrorism and the government performs ruthless interrogation procedures to find the culprits. So, these dreams are sort of an “escape”. In a case of mistaken identity, an innocent man (Buttle, not Tuttle) is killed during interrogation and those responsible for the mishap try to cover it up. Lowry is assigned to dispose of any evidence. This leads him to Shangri-La Towers, the home of Buttle’s widow, to whom he must give a check to compensate for her losses. While there, he runs into the Buttles’ upstairs neighbor, Jill Layton, who, oddly enough, is the woman from Lowry’s dreams. Layton has been trying to help the widow in finding out what happened to her husband, but has had no luck, and even more oddly enough, Layton is now considered a terrorist because of this. Eventually, the plot does evolve into something more straightforward. Lowry tries to convince the authorities otherwise that Layton is not a terrorist, but in doing this, he becomes considered one himself. What a bewildering, thought-provoking experience Brazil is. Chances are you’ll never come across another film like it again. The set design is one of a kind; beautifully cartoonic landscapes and almost toy-like urban areas. The general look of it is dazzling and in my opinion, it’s the best-looking science-fiction film yet. Sure, special effects are wonderful, but everything in Brazil is entirely made by hand. Is that a feat or what? And plus, it looks way better than anything a special effect could’ve done. The writing is magnificent. Satire is a hard subject to conquer. It’s not always so easy to be funny while keeping a consistently subtle tone of anger. Brazil pulls it off. It’s downright hilarious; both through words and actions, poking fun at areas where it’s necessary. Gilliam’s humor targets the bureaucracy, government control, and the downfalls of technology. The influences are obviously Orwellian, but the heart is totally Gilliam. As well, the performances are spot-on. This is Pryce’s first movie (and lead) role and he’s downright hilarious. Incredibly funny. But while he can act eccentric and paranoid, he also can be delicate in some of the film’s softer moments. The film’s wacky supporting character, Harry Tuttle, is played to comic perfection by Robert De Niro and even though he has barely any screen time, he manages to be the funniest in the whole movie. I’ve always felt that Terry Gilliam was one of the best directors out there. He’s innovative. He manages to funnel creativity into all of his work, never afraid to get a little weird. Of course, there is a setback to this. Just look at the box office totals from his films. That should pretty much say it all. Reality is always difficult to pull off in film, but fantasy is even more so. It takes close observation to be realistic, but imagination to be absurd. That’s why Brazil is so remarkable. It’s simply genius and, through countless viewings, has managed to amaze and confuse me in ways I can’t even imagine. It’s one of the most important films of our time and succeeds in every category possible. I hope you see it and like it as much as I do.